UPDATE — The Burnaby Board of Trade has presented our concerns and suggestions to all four Burnaby MLAs in person. The BBOT has contacted Minister of Finance Carole James to share our views on the employer health tax and presented our concerns in person with Attorney General David Eby at a recent roundtable with the minister. In BC Budget 2018 presented on February 20th, the provincial government announced the introduction of an “employer health tax” which will require organizations with payrolls of over $500,000 per year to pay a new payroll tax ranging from 0.98% to 1.95% to fund the removal of Medical Services Plan (MSP) premiums. The Burnaby Board of Trade does not support imposing the new employer health tax on businesses and not-for-profits. 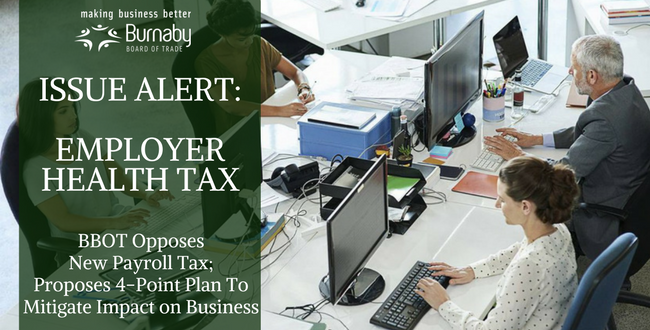 Businesses and non-profits were not expecting this new tax and for some it will be a significant new expense. Should the tax still go ahead, the Burnaby Board of Trade is advocating for several changes to be included in the final regulations/legislation to minimize the undue negative impacts of this tax. The Burnaby Board of Trade has several concerns with this new payroll tax as outlined in the BBOT POLICY ALERT below.